These encyclopedias are designed to stir kids' imaginations and drive their desire to explore new things. 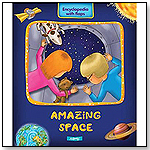 Each book presents fascinating facts, bright, colorful pictures, and a special feature: pages contain well-hidden flaps that contain even more information underneath them. Look closely to find them. Eye-catching illustrations broaden horizons. Action-oriented hidden flaps encourage kids to learn more.